300TC 550FP NIB! 5" sides, baffled, heavy fill weight! Wamsutta Modified Item: No. Type: Feather Bed Material: Cotton Blend. 300TC 550FP NIB! 4" sides, baffled, heavy fill weight! Pacific Coast Feather Bed Protector. 230 Thread Count Barrier Weave. Zippered Closure. Sink-in soft and superwarm, a featherbed invites cozy nights and relaxing, sleep-in weekends. Our down featherbed has comfort chambers filled with Freshness Assured™ hypoallergenic down on top and a feather-down blend below. 300TC 550FP NIB! 2" sides, baffled, heavy fill weight! Extra supportive featherbed will provide support for your body and provide relief for pressure points. Finally enjoy a wonderful night's sleep with this luxurious feather bed filled with white goose feathers. 5 Year Limited Warranty from Manufacturer. MADE IN USA of fine imported materials. Great way to refresh an older mattress. -HYPERCLEAN RESILIA FEATHERS with 230 thread count, 100% cotton Barrier Weave fabric to ensure against the feathers leaking out. Sink into the comfort of the Collection FiftyNine feather bed by National Sleep Products. A baffle box design allows the feathers to fully loft while minimizing shifting. Lusciously comfortable and well constructed. The special sized curled feather has the resilience and ability to spring back to its original loft. Attached 1" box stitched pillow top to prevent shifting is filled with 19 ounces of 100% white goose down for maximum loft to cuddle your body with the ultimate softness it deserves! The special sized curled feather has the resilience and ability to spring back to its original loft. Attached 1" box stitched pillow top to prevent shifting is filled with 16 ounces of 100% white goose down for maximum loft to cuddle your body with the ultimate softness it deserves! Sink into plush softness night after night with this lofty fiberbed from Sealy®. 54 x 75 x 2". 100% Cotton shell. 230 Thread count. Includes: 1 Fiberbed. Item must be UNWORN and in their original condition. 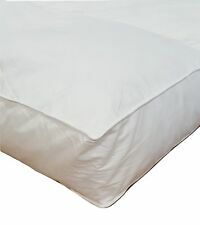 Soft-Tex Comfortable Solutions Deluxe feather beds top your mattress with a soft supportive layer of white duck feathers and white duck down wrapped in 300 thread count cotton fabric for durable, breathable comfort. New Pacific Coast Feather Baffle Bed With Protective Cover - Twin 39" X 75"
Baffle box construction. Cover: Cotton Fill: Feather. SIZE: Twin (39" x 75"). 250 Thread Count - Cover is 100% Cotton. Solid white shell design. Hyperclean fill has been thoroughly washed and rinsed to remove dust, dirt and allergens. 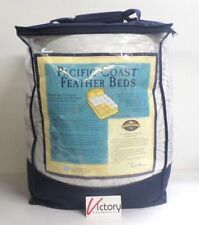 Pacific CoastÂ® Feather Bed Cover w zip closure Twin (Featherbed not included) 155. Prolongs the life and quality of your feather bed 155 Size: Twin Features: -Specially woven fabric. -230 thread count. 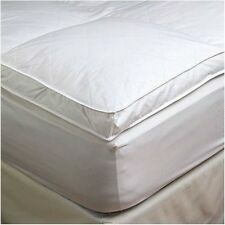 Northern Nights Uncrushable Full Featherbed with 2" Gusset Mattress Topper QUEEN SIZE. Sweet dreams are yours with this uncrushable featherbed. From Northern Nights(R) Bedding. Baffle box design; 2" gusset. 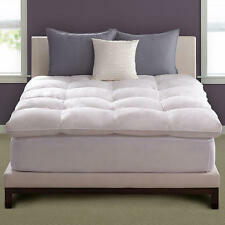 Northern Nights Uncrushable Full Featherbed with 2" Gusset Mattress Topper FULL SIZE. Sweet dreams are yours with this uncrushable featherbed. From Northern Nights(R) Bedding. Baffle box design; 2" gusset. Pacific Coast Basic Feather Bed Protector- California King. Manufacturer: Pacific Coast. Cal King - 76" x 88". Adding a plush, lofty topper is the perfect way to revive an old mattress, or add comfort to a mattress that feels too firm, without compromising the support it provides. Superior's premium hypoallergenic down alternative filling provides relief to those allergic to down mattress toppers and feather top mattresses. Size:Queen (60in. You'll sleep soundly on this luxuriously lofty featherbed! The boxes are baffled and sewn end to end so there is no shifting of the down. Sweet Jojo Designs White Goose Feather Topper and Down Baffle Box Featherbed Mattress Cover Top-Queen Size, (60in. ). ThisKing Feather Bed Mattress Pad is fluffy yet supportive. Filled with 100% white goose feathers it will give you a luxurious and restful nights sleep. The baffle box design of this comfy feather bed will provide even weight distribution and support though the entire night. Size:full Prolong the life of your quality feather bed by covering it with our Basic Feather Bed Protector in 230 thread count, 100% cotton. Prolongs the life and quality of your feather bed. Manufacturer: Pacific Coast Feather. Sleep like a dream atop this baffle box featherbed. It is made with feathers and down wrapped inside 100 percent cotton to provide supportive comfort, and it fits well underneath your bedding. Available in several sizes to suit your mattress size, this baffle box featherbed features athread count of 233 for a high-quality feel. The Purple® Mattress Protector does its job without ruining your mattress. Your kids don't have to sleep in yuck with Purple's amazing water absorption. And no more waking up in pain from a non-stretchy mattress protector. Item model number: 55877. We use only the finest materials to make the coziest down and feather bedding so we can provide you a sleeping experience like no other. You can feel good about choosing natural feather products when you compare natural fills to polyester. Cotton Down And Goose Featherbed. Cotton Down and Goose Featherbed. Grandeur Collection Overfilled 300 Thread Count. 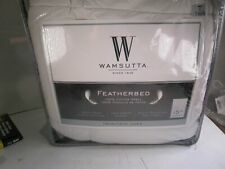 White featherbed mattress topper. Overfilled with soft down and goose feathers, this luxurious mattress topper. Type Featherbed. Gusset featherbed with pillow top. Product Features Baffle Box, Down Top. Baffle box design. A few hours of airing typically removes the odor. Fill Type Down, Feather. Pillow top filled with white down. Koni Feather Bed Mattress Pad Anchor Bands Double Size 54"X80"X2"